Alfred Yekatom during his initial appearance before the International Criminal Court on 23 November, 2018. Nairobi — The International Criminal Court (ICC) has a new opportunity to deliver justice to victims in the Central African Republic as it takes its first suspect into custody in its investigation of serious crimes committed in the country since 2012. Alfred Yékatom, known as "Rombhot," was taken into custody on November 17, 2018. Yékatom is an anti-balaka leader who has been charged with crimes committed between December 2013 and August 2014 in Bangui, the country's capital, and other locations in the Central African Republic. In 2016, Yékatom was elected to parliament representing Mbaiki. 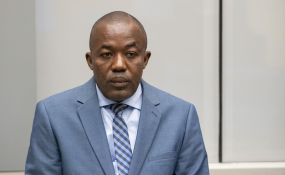 "Yékatom's arrest is a welcome step, offering the International Criminal Court a new chance to deliver justice for atrocities committed in the country," said Elise Keppler, associate international justice director at Human Rights Watch. "Victims in the Central African Republic want and deserve to see perpetrators held to account." The charges are part of the court's second investigation into crimes committed in the Central African Republic since 2012, when mainly Muslim Seleka rebels ousted President Francois Bozizé and seized power through a campaign of violence and terror. In late 2013, Christian and animist militias known as anti-balaka also began to organize counterattacks against the Seleka, and both the Seleka and anti-balaka are implicated in widespread atrocities against civilians. Yékatom is charged by the ICC with crimes against humanity, including murder, deportation, imprisonment, torture, persecution, enforced disappearance, and other inhumane acts. He is also charged with war crimes including murder, torture and cruel treatment, mutilation, intentional attacks against the civilian population, forcible recruitment of children, and displacement of the civilian population. The ICC's first investigation in the Central African Republic, related to an earlier conflict in 2002 and 2003, has yet to successfully hold any individuals to account for the crimes. The first investigation, which has been open since May 2007, has produced only one case, against Jean-Pierre Bemba, a Congolese former vice president, which ended in an acquittal on appeal in June 2018. Human Rights Watch criticized the lack of additional cases in the ICC's first investigation in the Central African Republic. Human Rights Watch has urged the ICC's Office of the Prosecutor to pursue charges that are representative of the crimes committed in situations under investigation to ensure the delivery of justice is meaningful. "The ICC's first investigation in the Central African Republic has left victims without redress after the only case ended in an acquittal," said Keppler. "The charges against Yékatom should be the first case among more involving crimes committed by all sides in the Central African Republic." Yékatom, a master corporal in the national army before the conflict, promoted himself to "colonel" when he became a key anti-balaka leader in 2013. On August 20, 2015, Yékatom was added to the United Nations Security Council Committee's sanctions list for undermining national peace and security by "engaging in or providing support for acts ... that threaten or impede the political transition process ... or that fuel violence." Human Rights Watch has previously documented his alleged role in sexual slavery, although charges expressly involving crimes of sexual violence are not included in the ICC's arrest warrant for Yékatom. In a 2017 report, 'They Said We Are Slaves', Human Rights Watch documented how one sexual slavery survivor said she and five other women and girls were held, repeatedly raped, and forced to work for three days in April 2016 by men who said they were under Yékatom's command. ICC investigations in the Central African Republic are complemented by the work of a new court in the country, the Special Criminal Court, which is staffed by international and Central African judges and prosecutors, and the country's ordinary courts. The Special Criminal Court officially launched operations in October. Copyright © 2018 Human Rights Watch. All rights reserved. Distributed by AllAfrica Global Media (allAfrica.com). To contact the copyright holder directly for corrections — or for permission to republish or make other authorized use of this material, click here.